According to a new report by analysts firm Nielsen, Facebook Messenger was the fastest-growing app of 2015, TechCrunch is reporting. 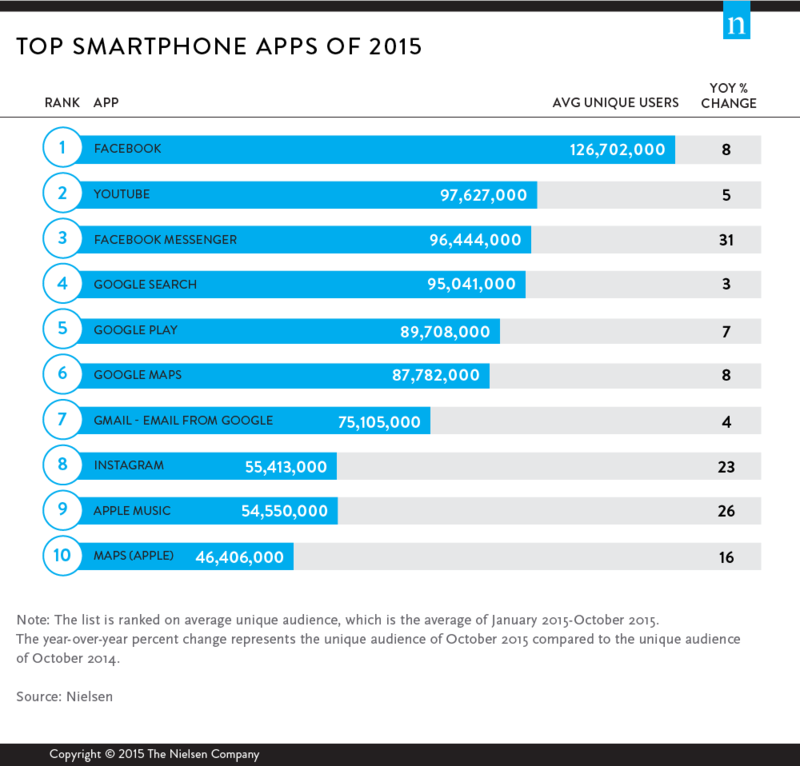 However, the title of the top app installed on U.S. smartphones based on the average number of unique users went to the Facebook’s main app yet again. The source notes that Facebook Messenger grew more than any other app in 2015, with a 31% increase in users from last year. While a 31% growth rate seems pretty impressive, the report claims that the growth is actually slower than last year when Messenger grew 242% over the prior year, thanks to Facebook’s huge push and its decision to completely remove the chat feature from its main app. In terms of the top apps by users, Facebook led the way again with more than 126 million average unique users each month, up 8% over last year. YouTube came in at second spot with 97 million average unique users each month, up 5% from 2014. For what it’s worth, Facebook itself said last month that it had 1.39 billion mobile monthly users worldwide, up 23 percent year-over-year, and 217 million monthly actives (not just mobile users) in the U.S. in Canada in Q3 2015. Other top apps of the year included Google (Search) with 95.0 million mobile users, Google Play with 89.7 million, Google Maps with 75.1 million, Instagram with 55.4 million, and Apple Maps with 44.4 million, says Nielsen. The report highlights that Apple Music was also in the running for fastest-growing app, which saw a 26% year-over-year climb, though the service was launched only six months ago.